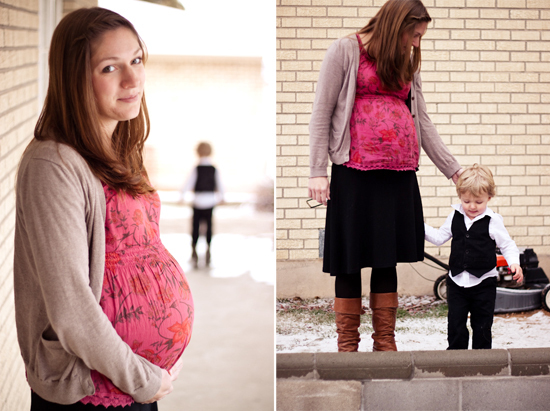 Strawberry Chic: 36 Weeks Pregnant + A Funny Story . . .
36 Weeks Pregnant + A Funny Story . . . I'm 36 weeks pregnant now and only have 1 month left to go! I have been meaning to purchase a new full length mirror ever since ours broke a couple of months ago. So, last weekend, I bought a new one at Target and was excited to finally see what my outfit looked like from top to bottom! After my husband had hung it in our closet, I glanced at myself in the mirror for just a second and immediately thought I looked a little funny. I then asked my husband to take a look at himself too. He stepped back, took a quick glance, and said something like "looks perfect to me." The next morning, after getting ready for the day, I stood in front of the mirror and took an even longer look at myself. My first thought was this..."oh my word, I am HUGE...everywhere." Every time I walked by that stupid mirror during the day I would catch a glance of myself and think things like, "I have never seen myself like this before" and "how did I ever let my weight gain get this far!?" When my husband came home from work that evening I was fairly grumpy and easily agitated. I finally asked him to please go look at himself in the mirror again (hoping that maybe his image would change). He rolled his eyes, stood in front of the mirror, immediately started laughing, and admitted that the mirror was indeed warped! I pushed him aside and stood in front of the mirror myself... then he really started laughing! I looked about a foot shorter then I really was, my body looked about 30lbs heavier, and my pregnant stomach was abnormally large! I was relived to know that I was indeed right about the mirror, but I couldn't believe that I had spent a good portion of the day starring at myself in that evil mirror in self-pity. Hope your having a great day...and remember to always trust your initial instincts! you look amazing - crazy mirror or not! :) I'm almost 26 weeks w/ my 3rd and I'm pretty sure I'm bigger than you already, so don't worry!! That IS funny and I bet you are relieved. You look lovely, especially for 36 weeks! You could technically have your baby next week and things would be fine (I delivered at 37 weeks to a 8 lb 13 oz baby). How exciting!!! I think you look great! That's a funny story:) I had the opposite thing happen with our mirror. We had put up a full length mirror at the end of our hallway and it made everyone look thinner:) It was a very popular mirror. Best wishes for an easy labor! Jaja, ;) La pancita se ve preciosa, ya falta poco! Oh my gosh, this is so funny and also so sad. lol. I have never owned a full length mirror. I bought 2 $10 ones on separate occasions and both broke before even getting put on the wall. Slipped too many times on the bath tub trying to see my outfit so I finally splurged majorly (reward to myself for getting half way to my weight goal!) on the Hovet Mirror from IKEA and loooooooove it. It feels more expensive than it is. Love doing Yoga by it. Hope you find a better one soon!! !